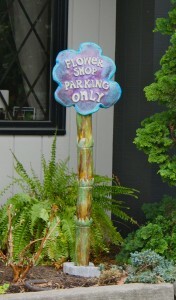 Earthsongs: Works in Clay - A fine art ceramic studio in the heart of Metuchen, NJ. With Junebug behind us, life at the studio settles into the gentler rhythm of the summer months. While quite counter-intuitive, I do not offer any classes or workshops, but I reserve the summer for developing new work for autumn and Holiday sales and as a time for recouping and renewing. Creative activity necessitates a degree of solitude and quiet interiority, and though visitors are always warmly welcome, the whole property becomes a quiet hub of creativity, with new ideas growing: Michelle developing work from earlier molds, Nino doing an amazing re-design this summer of our kitchen, and I developing designs for new commissions and other projects. As I worked in that environment, I began to reflect on the effect other local artists continue to have on my art, both through their work and their personalities. Full-time professional artists are an interesting lot, and one of the benefits of living in Metuchen has been to get to know a number of them. All of these are people with BRIGHT SPIRITS! Yes, they have a care and fierce dedication to their art that often calls them to spend lots of time alone in their studios; and still they delight in the creative process. This summer, I realized how much their viewpoints, their “eyes” have helped inform my own way of looking. 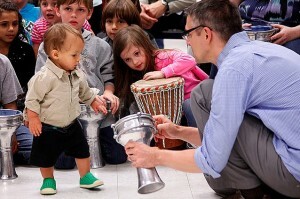 But even more, their attitudes continue to be a source of inspiration. The generosity of these artists…each and every one…continues to be a great encouragement to me. These are people who by their very life and work create an environment of community. I have found them ever willing to assist, share ideas, help solve technical problems, generally lend a hand. They willingly share equipment and enthusiasm. From David Glasofer, owner/artist/photographer of Image Up Studio, to the married artist teams of Kim and Danny Adlerman and Janice Fried and Bruce Donnola, to the photographers Judy Weinberg, Mark Harris, and Michael Martin, and Kyo and Jana Morishima; the sculptors and art educators Duffy Dillinger and Roy Chambers, Lauren Rabinowitz, our local web guru and, of course, my sister artisan Amy Brooks. The work that has been on my studio easel for a number of weeks is the large Guardian figure I am creating for a local homeowner. Intended for the porch pediment of her Victorian home, it is large, measuring nearly 6’ at the base. Having done drawings, from which she selected her choice; then a small, scale model to allow her to see color possibilities and treatment of wings and other features, I set out to fabricate the actual mural. I began with several small areas and then plunged into the large figure herself. The client’s wish was to have a very traditional angel-like figure in that space. Early in the process, the client stopped in, quite unannounced. I had always encouraged her to visit whenever she, a runner, was ‘running’ by. And this particular day, she did. The Guardian was very much in the early stages of development, with odd lumps in strange places and a very unbecoming expression. The client looked on in dismay. I simply said she was ‘in process’ and this was ‘not her best moment’. I needed to work with the clay, struggle with the image until what emerged was that for which we both were hoping. There was a lot of silence and looking, and I felt a lot of uncertainty in her leaving. As for me, I simply continued working and brought the Guardian to a point of satisfaction for me: a strong, gentle figure, cradling the client’s home in her arms. 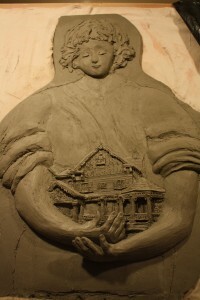 The clay artist is the one who must face and understand process. Not every moment is beautiful. The potential is always there…but the artist must fearlessly stare down the awkward and gently wrestle the clay into beauty. There can be no panic in the moments when the form is way off balance, or the image far from what’s hoped for. The artist must simply move forward with assurance in her ability to bring forth the image. In the work of art which is each of our lives, the same is true…as shaper and creator and artist, we must acknowledge that all moments are not our best,…fearlessly stare down that which is awkward, unlovely, and…move forward with assurance in our ability to create what is the best and most beautiful person. The sign and the fountain were initially installed in August, 2001. 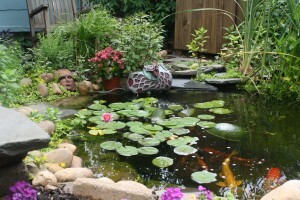 My initial plan was to have a small flat ceramic slab over which the water gently bubbled. Nothing more: very unassuming, very unobtrusive., something that would surprise people only if they looked. Nino, of course, made my plan actually work: installed the electricity, designed the hidden water container, found just the right kind of screening to support the ceramic slab, secured the proper flexible piping. And when all was done, nobody ever noticed because it was just too modest! The next year, he set it up so that the water shot up higher…more noticeable, but not very elegant. Friday, September 24, 2001, I had scheduled a “Meet the Artist” at What’s the Scoop, the new ice cream parlor that just opened the previous summer and allowed me to exhibit my work. Out of the events earlier that month, I decided to include an opportunity for all who visited to engage in clay therapy…fashioning their personal response to 9-11 with clay. Mike Patterson, the owner, further agreed to have the “Fountain of Peace” into which I formed all of those responses in the front of the store. I added a clay base to hold water, and three birds of peace as a cap. It gurgled there as a reminder and a sign of hope for an entire year. When I finally dismantled it, not wanting to destroy any of the parts, they were stored in our garage. 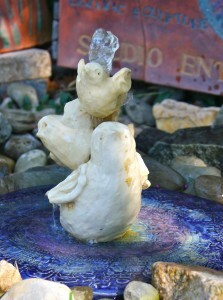 During the Spring clean-out the following year, I non-chalantly placed the birds on my clay slab fountain…SATORI! The birds completed it. They were what was needed all along. They were the perfect addition. Now, with the water playing over them, the birds continue to bring a spirit of tranquility to a very busy street in a very busy area. Children in strollers beg to visit ‘the little birds’…and older children confide how they “loved to see those birds anytime they drove or walked by since they were little”. Art creates community. We share images. They shape us. And three hopeful little ceramic birds continue to be a source of bonding for those in Metuchen, NJ.